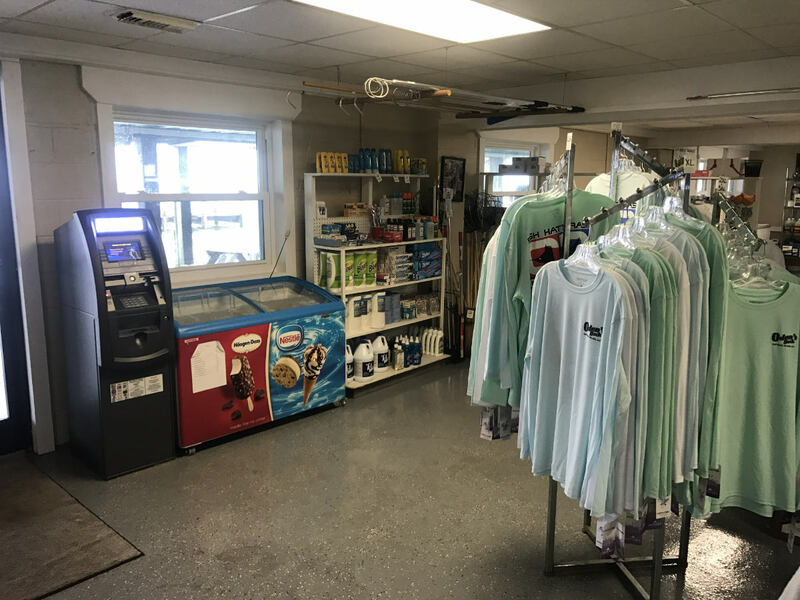 The Ships Store at Oden’s Dock is well equipped with everything you need to have a great stay in Hatteras Village. Whether you’re here to fish, sightsee, or just relax, we have a wide variety of items to make your stay comfortable and enjoyable. The ship’s store is stocked with lots of food and drinks, including cold drinks (soda), beer, chips, snacks, ice cream (pre-packaged, not scooped), and more. For our morning customers, we offer breakfast sandwiches, muffins, and fresh coffee for you to get you ready for your trip. Bags of ice are available in 10, 20, and 40 pound bags. Some pantry items such as paper towels, Ziplock bags, bleach, and dish soap are available for purchase. Styrofoam coolers, flashlights, and batteries can also be found in the ship’s store. We also offer some personal care and first aid items like ibuprofen/aspirin, dramamine (for sea sickness), bandaids, sunscreen, bug spray, and more. We offer a wide variety of tackle including knives, hooks, lures, fishing line, weights/sinkers, swivels, hand nets, and much more. Some fishing poles are also available for purchase. Frozen mullet, squid, and ballyhoo are available as bait. We also carry tools and supplies for boats, like boat fuel filters, boat batteries, and other supplies for repairs and maintenance. If we don’t carry something you need in the Ship’s Store, there’s a good chance you can find what you need close by in the village. There are many shops that offer a variety of general needs, groceries, food, apparel, fishing gear, and more. Take a piece of Oden’s Dock home with you with gifts and apparel from our gift shop! We have a wide range of apparel including hoodies, t-shirts, hats, and visors. All of our apparel features Oden’s Dock so you can always be reminded of your stay in Hatteras Village. We also offer Hanes Cool Dri and Denali UV protectant shirts, both short and long sleeve styles.